We wanted to work with Sue because of her knowledge of the location we were interested in. She was professional, cared about our needs, and worked well with our friend when taking her to look at properties without us! Sue made time for us whether it was weekend or evening, and she also delivered our keys to us in Williston. We’d worked with Sue previously, and she was very helpful and willing to show us properties anytime! She had prompt attention to matters and helped us find properties available on the market. Sue was very helpful the entire process. She made buying my home simple and enjoyable. It was a great first-time home buying experience, and I really appreciated her in the negotiation process. What I liked best about working with Sue was her willingness to answer questions. The process went very smoothly. Sue was very kind and genuine. Sue was referred to me by a family member. What stands out most to me about the real estate transaction was the ease of everything. Sue was very attentive & patient. I chose to work with Sue because she is my hero! I would recommend her to my friends and family. Sue was very personable. She was very friendly – appreciated her taking me out to property. We chose to work with Sue because she has done a good job for us in the past. What we liked best about working with Sue is her professional, but personal service. She helped us find a great neighborhood and offered to do more than expected. Sue was recommended by our daughter-in-law. What we liked best about working with Sue is her high level of communication and helpfulness. Sue was available to answer questions, and kept us informed during the process. Sue’s professionalism, expertise, and communication all deserve five stars! She cares about her clients and their needs. What we liked best about working with Sue was the timeliness and effort she put in. What stands out most in our minds is the amount of professionalism and care she put into us and our needs. We loved working with Sue! I worked with Sue previously and liked her. I felt she was very professional and helpful. What we liked best about working with Sue was that she had answers and was very helpful with all our needs. Sue went above and beyond our expectations to help close the deal. Sue was very friendly and upfront. She was exceptional, and I felt very welcome to the Spearfish area! Excellent communication and prompt attention to any questions and/or issues. I felt that Sue thought this was the only house she was dealing with, when I know she had many more. We’ve always had very prompt and professional service from Sue! Excellent to work with! We chose to work with Sue because she is awesome, attentive and fun! We enjoyed her willingness to help walk us through the whole process, especially since it was our first home! Sue answered all our questions. Sue was very professional and treated us great! I have worked with Sue in the past. The best thing about working with Sue is her compassion and professionalism! I would recommend her to all my family and friends! Sue is quick, professional and responded to our questions and needs! What stands out most in our minds is Sue’s helpfulness in dealing with problems/stressful situations during the process. What I liked best about working with Sue Cramer was her professionalism and knowledge! The most disappointing thing about the real estate transaction was that I didn’t use Sue’s services earlier! What a good experience I had after I switched to Sue Cramer as my agent! We chose to work with Sue because she is good. What we liked best about working with Sue is she got it done! Sue Cramer and The Real Estate Center have handled our real estate needs at the Frawley Estates and Elkhorn Golf Estates. We are very satisfied with her professionalism, marketing and especially the results. Even in the difficult housing market and recession The Real Estate Center has performed above expectations. Sue Cramer represented us when we bought our property in Spearfish in 2007 and when our plans changed, she represented us in the sale of our property this year. Sue was diligent and dedicated, even when the market lost steam…she hung in there with us through thick and thin. Thanks a million, Sue. You’re the best and we would definitely recommend you to others! I found Sue online and she looked honesty and trustworthy – Sue made the real estate transaction easy! Been working with Sue since 1996. Sue went the extra mile – condo Sold in 2 days even in the middle of winter, Wow! What stands out to me most about this real estate transaction is Sue’s personal interest, her stopping by to have papers signed, and the deposit of funds upon closing when I was out of town. Great job Sue! I chose to work with Sue because she handled other properties for us and I was happy with her and her services. I am satisfied with the help I was always able to receive from Sue. We chose to work with Sue because of her good reputation. She kept us informed for the entire 3 year process, with patience displayed at all times. Sue explained the bank process and we felt she helped the bank through the closing. She called right after closing to congratulate us! Sue showed care and concern for everyone who was involved in the transaction. The personal contacts you provided made a hard thing easier. Thank you Sue. What we liked best about working Sue was her personality and knowledge. We found Sue on Realtor.com – she very helpful, even with a long distance transaction. Sue was willing to go over and above expectations to help us! What we liked best about working with Sue was her prompt answers to questions, and she was very polite and efficient! It was a very clean – fast deal! I chose to work with Sue because of past experience and she is well known. She is professional, a good communicator, gave updates and has great knowledge of the Northern Hills Market. The ease of talking to Sue and her knowledge of the Black Hills area we choose to look at, are a few reasons why we chose to work with Sue. Everything was handled professionally. It is nice to deal with people who are straight up and honest. Sue handled things without pestering me. Hands off and carefree transaction. Easy for me. What we liked best about working with Sue was her professionalism, attentiveness, communication, knowledge, and truthfulness/openness regarding the market and properties. Meetings with Sue were positive and left us very comfortable with her. Sue is friendly and helpful personality. She answered all our questions and really tried to get us what we wanted for a land purchase. Everything seemed to fall in place so easily. We have known Sue for many years – we appreciate her knowledge, integrity, and flexibility. Sue took her time to listen and understand our needs. Sue put great effort into my wishes and needs. What I liked best about working with the Real Estate Center is the high grade of professionalism that I received from both Sue and the office. What we liked best about working with Sue was her honesty. She showed us homes within our financial means, she referred a home builder that would build a home to fit our needs, and she found a development that would fit our needs. Everything went as planned! We enjoyed the entire process. Sue is very good. What stands out most in my mind is that her timeliness was outstanding. We were lucky to pick Sue. She went wherever we requested. I chose to work with Sue because of previous help with my home evaluation. She was very efficient, making things go very smoothly. We chose to work with Sue because of her good reputation and friendliness. Sue is very experienced and knowledgeable. What I liked best about working with Sue is that she was very professional and responsive. 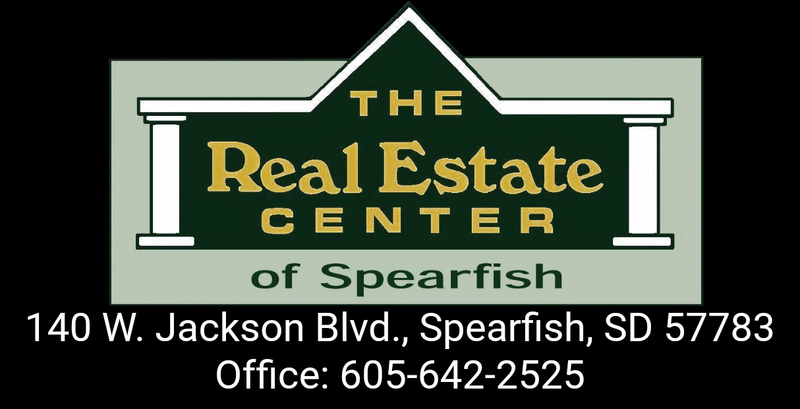 Sue really knows the dynamics of the local Spearfish Real Estate market! Sue was very informative and professional. We felt very taken care of, just as if we had known everyone there forever. Everything went smooth! We’ve had good experiences in the past with Sue. She was always strongly recommended by others, very friendly, efficient and timely. What we liked best about working with Sue is the dedication and hard work she put into selling our home, finding a new one, and making sure the entire process went smooth! Thank you SO much! We chose to work with Sue because we had worked with her previously and she was very professional, knowledgeable and pleasant. What we liked best about working with Sue was her willingness to work with us no matter the time or day. Always willing to meet us and look at property, and always willing to explain things so we understood. She made the real estate transaction easy. We chose to work with Sue because she was highly recommended to us. What stands out most was the ability to sign documents over the internet. We chose to work with Sue because we knew her and heard she was the best 🙂 What we liked best about working with Sue was her easy communication and timeliness of getting back to us!